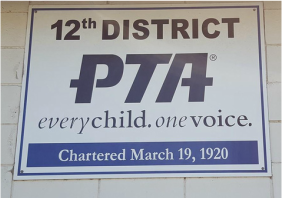 12th District PTA is a volunteer organization that services the PTA Units and Councils in Ventura County. We provide support, training and leadership to assist the 6 Council and 125 Unit PTAs to be successful. ​12th District PTA is pleased to be able to offer our Graduating High School Senior Scholarships for the 6th consecutive year! We are awarding four - $500 scholarships to 2019 graduating high school seniors who attend a PTA/PTSA school in Ventura County. The scholarships are awarded to seniors who have exhibited outstanding service and volunteerism to their school and community. Applications are due to 12th District PTA before 11:59pm, March 31st, 2019. Click here to download the application. 12th District HSA Nominations Are Now Open! Each year, PTAs across the country pay tribute to individuals who demonstrate an uncommon commitment to students and schools. In the tradition of the National PTA's Honorary Service Awards Program, 12th District PTA seeks nominations to recognize individuals and organizations that contribute significantly beyond their school sites and PTA councils in serving children and youth. Please help us identify and honor worthy candidates who serve with distinction at the regional or county level. Deadline for nominations is Friday, April 12, 2019. Click here to download the nomination form.